After a pet has passed on, it can often be difficult for life to return to normal. 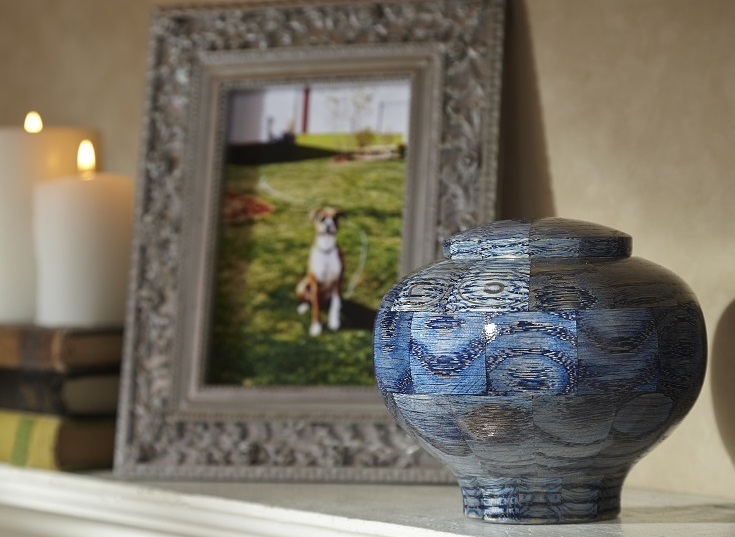 While nothing can ever replace the love of a loyal animal, we have learned that many people find comfort in having a decorative pet memorial urn on display in their home. 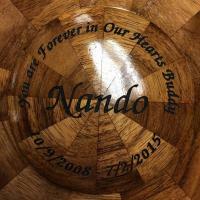 The Steve Shannon Collection of handcrafted wooden urns come in a variety of sizes and styles, and every celebration of life urn you see here in our collection can be used as a pet urn. 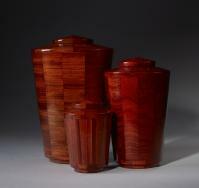 Once you choose the urn style in STEP 1, you can choose the proper size in STEP 2. A quick rule of thumb is that for every pound of weight you should have a cubic inch of space in the urn. 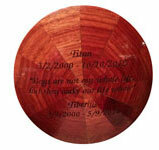 Some families choose a larger urn in order to include their pet’s collar, tags, or favorite toy. Cubic inch capacity varies a bit with style, see description on each product page. Keepsake Size: For small pets up to 15 lbs. Small Size: For most medium or large pets ranging from 15-94 lbs. Large Size: For larger pets over 95 lbs. Equestrian Size: For horses up to 1100 lbs. Deciding on the final resting place for a beloved pet is not something to be taken lightly. You will want to choose an urn that fits your pet perfectly—whether you are honoring a dog, cat, rabbit, bird, guinea pig, horse, or other cherished animal—we offer different styles and colors to match your pet's personality. In STEP 3, you can choose from a wooden pedestal with a personalized brass nameplate or a laser etched cap (for most designs). Three font styles are available. If you are seeking an urn for your pet's ashes, we will be happy to assist in your decision-making process. 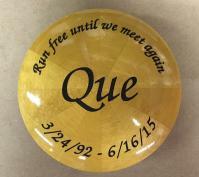 Whether you wish to design a custom urn with Steve or need help in choosing an urn from our collection, we are available to ensure that you find an urn that perfectly represents your beloved pet. Feel free to contact us online with any questions or call 1-844-ART-URNS. The gorgeous Wisdom Urn you made for us is still on the center of our fireplace. I wanted to thank you sending me a picture of your beautiful red dog after we spoke on the phone. It meant a lot to me! I am disabled and my husband was not going to get another dog. Then he saw this photo and we have now had our new dog for almost 4 weeks. We named him Shannon, after you. You touch the lives of so many people through your work and there are not words to express how you help soothe during difficult times.